R&R! To some people that means rest and relaxation. To Darrell Sehorn it means radio and real estate. Darrell is the voice of KGRO/KOMX radio serving as manager-meteroroligist. Darrell has been involved in radio in Pampa since 1969 and a licenesed salesperson with Quentin Williams, REALTORS since 1980. Darrell Sehorn is a name on the go from chasing storms to selling real estate. He enjoys the diversity of his work. Darrell and Linda, his wife of 39 years, had two daughters, Shannon Stephens of Seabrook, Texas and Stacey who is in Heaven. 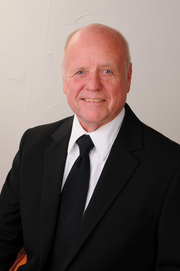 With a lot of skill in advertising and marketing, Darrell looks forward to serving your real estate needs.